Just before moving in with my girlfriend at the end of last month, I put the finishing touches on a song that’s very important to me. “To Remember” is song about my father’s guitar, which is to say that it’s also about my father, and about the relationship that I had with him. I’m not ready to share the song just yet, however since it’s themes are so integral to the work that I’ve been doing, I thought that it might be healthy for me to open up about how and why I wrote it. Some backstory: about a year ago, my dad died unexpectedly of a heart attack. He was 58. As one might expect, the last 14 months have been fairly confusing and at times really difficult, but as always I relied on music as a way to help me through the rough days. And given the fact that I was already knee-deep into the album I have been making when he died, the writing process very quickly absorbed many of my feelings about his passing. What makes my particular method of healing all the more complicated is the fact that music was always the central device that connected me with my father. Admittedly, my relationship with my dad was not exceptionally close, but music drew us together in ways that helped us understand one another. When I was a teenager, my father gave me his guitar—a cream-colored 1962 Fender Jaguar with a tortoise shell pick guard, which had belonged to my dad since he was 14. As a boy I’d only seen it on the handful of occasions when he took it out from under his bed, its classic look and sound fascinating to my young mind. By the time I was old enough to play it, Kurt Cobain had further extended the model’s mythology by playing right-handed Jaguars upside down (as a lefty, I do the same thing). At the time, I’m not sure that I could have claimed total ownership over the instrument—my brother and I had effectively acquired it on a semi-permanent loan—however I felt an increasingly strong sense of confidence over the music I made with that guitar. 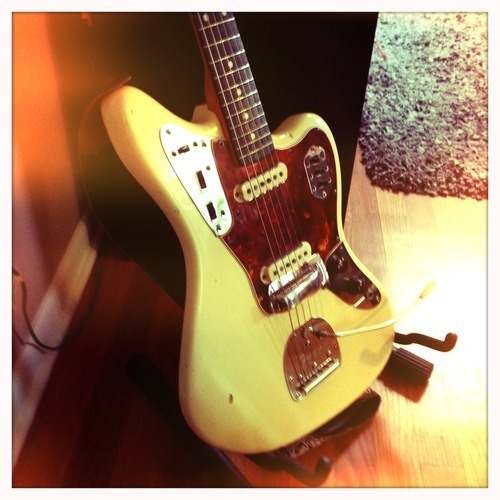 I have a vivid memory of writing one of my first songs with the Jaguar: I must have been fifteen, sitting cross-legged on the floor of my bedroom next to a washing machine-shaped amplifier, laboring over a riff that mimicked Jawbox’s “Chinese Fork Tie.” I can still play that melody today. It’s not bad. After graduating college I was lucky to bring the Jaguar with me to Chicago. Given the fact that I was almost entirely broke, the physical possessions I could call mine were few and far between, save for a rapidly expanding CD collection, and my two guitars. As time passed, I continued to write songs on it—”Negative Space”, an early song by a band I once played in called the Modern Temper, was crafted with the instrument. Most of my early years were spent at a considerable distance from my father—in hindsight, I think that he might have struggled with how to relate to my sensitive disposition; perhaps he just didn’t have a lot of patience for kids and teenagers—but by the time I had grown into adulthood, things had become easier for the two of us. Our conversations, once awkward, had turned affectionate and cheerful. In our semi regular-yet-brief phone calls, he often told me how proud he was of me—how much he liked the new song I just released to the public, or how cool he thought it was that my music had been played on a radio station he once listened to when he had lived in Chicago. On the rare occasion that he visited, my dad would set up his laptop on my apartment’s coffee table and pick out CDs from my shelf until he had stacks of them waiting to be burned to his computer drive. Ever the classic rock fan, he and I found plenty of common ground in revivalist groups like The Walkmen, The White Stripes, and Spoon. A couple of years ago, my father asked for his Jaguar back. As his career had lightened up a bit and responsibilities softened, my dad had slowly felt the desire to re-introduce his teenage fascination with the electric guitar into his life. I gladly returned it to him, and in response he continued to provide me with updates on the latest Rolling Stones song he was learning, or how he had finally honed in on the best sounding flat-wound strings. The last time I was alone with my dad was on the day after Christmas, 2011. I had intended to sneak away for an hour while visiting my parents’ house to work on a song, and about 10 minutes later, my dad had quietly shuffled upstairs to see what I was up to. With a gentle knock at the spare room’s door, he asked if he could listen in. Sitting down in a chair adjacent to me, my father lifted his Jaguar off of its stand and placed it in his lap, and asked me to replay the guitar riff I had been rehearsing before he had arrived. I obliged, running through a simple finger-picked phrase made of descending chords while he watched intently. We talked for a while, discussing the Gastr Del Sol and Wilco albums which had influenced my most recent batch of songs, and about how he had always tried, unsuccessfully, to master the finger-picking style I was using. I don’t exactly recall how that encounter had ended, but I remember feeling both surprised and glad that he had joined me in a moment that I expected to be a solitary one. There are plenty of ways to remember people after they’re gone: through the stories we tell, the objects we hold dear to us, through our behaviors, interests, and values. I remember my father most vividly through the songs he used listen to: the family vacations set to Paul Simon’s “Graceland”; the blaring, repeated plays of “Money For Nothing” that filled our garage on nights and weekends; hearing John Fogerty’s “Old Man Down The Road” as we drove in my dad’s wood-paneled station wagon through small-town Illinois. The love of music that my dad helped instill in me is so deeply a part of who I am that I simply can’t imagine what my life would be like without it. And in that sense, the songs that I write—even the ones that aren’t about him—are about him. I can’t think of a better way to celebrate the time that we had together than to share with the world the thing that made us closer.